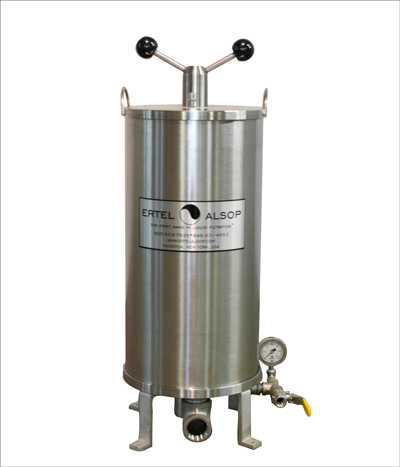 ErtelAlsop’s standard industrial filter housing used with the grade Zeta-Pak® , is designed for everyday use in chemical applications where the high polish of the pharmaceutical grade housing is not required. The filter is available in Carbon Steel, 304, 316, or 316L Stainless Steel, Polypropylene or Fiberglass Reinforced Polypropylene. Flow rates of up to 375 liters per minute per housing are feasible and housings can be mounted in series or parallel on a single framework to allow for higher flow rates and/or throughput. The filters are available with the standard gasketed head and external tightening handle or in our flanged head with internal tightening handle design with the option for ASME code.